Product #45776 | SKU XEVA-82CPL | 0.0 (no ratings yet) Thanks for your rating! 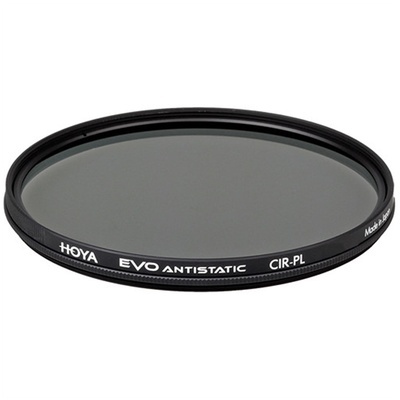 The Hoya 82mm EVO Antistatic Circular Polariser Filter helps to reduce reflections and glare by filtering out light that has become polarised due to reflection from a non-metallic surface. This results in a noticeable increase in the saturation of skies and foliage, as well as clearer imagery when photographing in hazy conditions. A circular polariser differs from a linear polariser in that it supports full use of a camera's autofocus and auto exposure functions. The EVO antistatic coating on this filter helps to repel dust, as well as water, scratches, and stains, and aids in making the substrate easy to clean. Additionally, a 16-layer Super Multi-Coating helps to reduce surface reflections and ghosting for maintained contrast and clarity. The optical glass filter is set within a two-piece low-profile aluminium ring, which lessens the likelihood of vignetting if used on a wide-angle lens. The ring also features front threads for attaching additional filters or lens caps. Reduce reflections and glare by filtering out light that has become polarised due to reflection from a non-metallic surface. Arrange and filter directionally polarised light perpendicularly to the reflected light allowing for the absorption of much of the light. Lessens haze in distant landscapes and provides more saturated, vivid colours. Optical glass construction and a 16-layer Super Multi-Coating provides 99.8% light transmission for maintained contrast and colour fidelity. EVO antistatic coating helps to repel dust and is also water, stain, and scratch-resistant. Additionally, this hardened coating is also easy to clean in order remove smudges or fingerprints. Two-piece aluminium filter ring features a low profile to reduce the likelihood of vignetting when used on wide-angle lenses. Additionally, this ring incorporates front 82mm filter threads for stacking additional filters or attaching lens caps. Box Dimensions (LxWxH) 4.3 x 3.6 x 0.6"